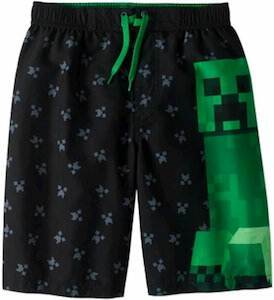 You can get this Minecraft t-shirt in styles for men, women, and kids and comes in many colors and in sizes from kids 6 months all the way to adults 6XL. 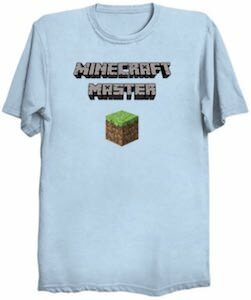 On the shirt is says “Minecraft Master” and the text is in the Minecraft font and then below the text it shows the grass block every Minecraft player knows and probably mined to many off while doing some fun building in your Minecraft world. 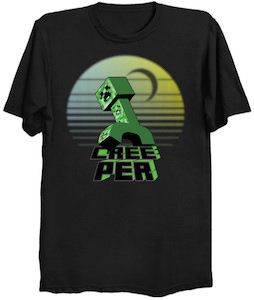 Time to get your own Minecraft Master T-Shirt. Now gamers can dress up in style by wearing this classic joystick t-shirt. The joystick shirt is available in styles for men, women, and kids and it is available in many colors and sizes and even as hoodies. 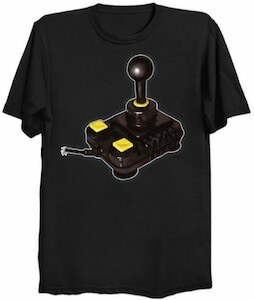 On the shirt you can find an image of a big classic looking joystick that is black with yellow which makes it look pretty cool on it. Now you can start a new video games because you have a clean t-shirt to wear that also fits with your favorite activity playing video games. So if you need a new cool shirt then come get your Classic Joystick T-Shirt. If your child wants to be Steve from Minecraft this Halloween then you should check out this Minecraft Steve head mask. This is the Steve head only it is half and that makes this just what you need to become Steve from Minecraft. The Minecraft head is made from plastic and has elastic straps to connect to your kids head and after Halloween this mask will look great in your room to. 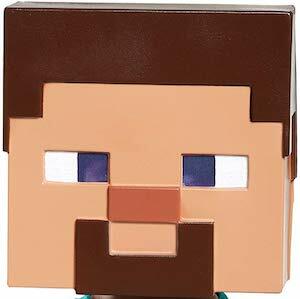 So become Steve and do some mining and building while wearing this Minecraft Steve Head Mask. If you are a gamer that gets out one in a while to mingle with people then you should check out this I Pause My Game To Be Here t-shirt. The t-shirt is available in black, blue, green, red, and olive and is available in styles for men, women, and kids and comes in sizes to fit them all. On the t-shirt it says in big letters “I Pause My Game To Be Here” and it has a worn look just like you always take this t-shirt out when you leave your home and your video game to go hang out with your friends. 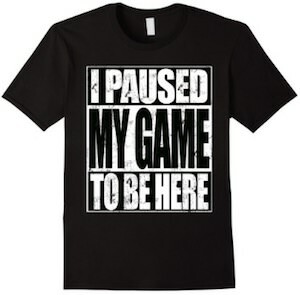 So if you are a gamer that goes out then you just need this I Pause My Game To Be Here T-Shirt. 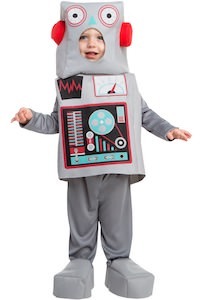 This child’s robot costume will transform your child into a really amazing looking robot. The robot costume is available in different toddler sizes and includes a head piece, top, and pants with build in shoe covers. So just put this outfit on your child and a little robot is born and it will look just perfect for Halloween and trick or treating as little robots do love candy so make sure they have a great big treat bag. Besides Halloween, this costume is fun as just a dress up costume too if you kid loves to be a robot. Come and check out this fun Child’s Robot Costume. If you like computers a lot then you should get this amazing t-shirt. On the shirt, you can see a guy running and a computer is on his mind and around the graphics, it says “I Must Go My Computer Needs Me”. And this cool computer t-shirt is available in style for men, women, and kids, and it comes in many sizes and a bunch of colors. So when you wear this computer t-shirt people around you will know when you need to go and they will know that you really want to spend quality time with your computer instead of hanging out with friends. 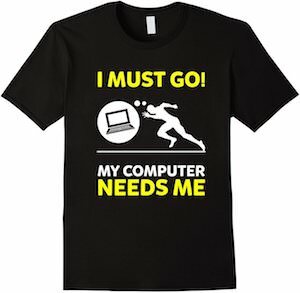 Don’t wait just come get your I Must Go My Computer Needs Me T-Shirt. If your child really likes to play Plants vs. Zombies and is looking for the perfect Halloween costume then this Peashooter costume could be just perfect. The Peashooter costume is available in many kids sizes 6 -14 and includes jumpsuit, headpiece, feet covers, and gloves so everything you need to become a real life Peashooter from the Plants vs. Zombies game. And besides Halloween, it could be a fun costume for dress up or maybe a game convention. It also makes me wonder if it would work if there is a real life zombie invasion because in that case maybe it should be part of your emergency kit. 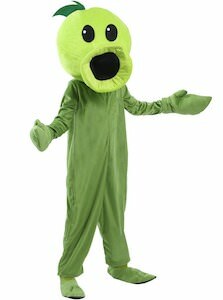 Come and get your child this fun Plants vs. Zombies Peashooter Costume. It does not matter how old you are, you can always play with LEGO and this t-shirt is perfect for you if you enjoy building things with LEGO. On the t-shirt, you can see the evolution of a Minifigure and it all starts with a small piece of LEGO and from there it grows up into the little characters we all know and love. 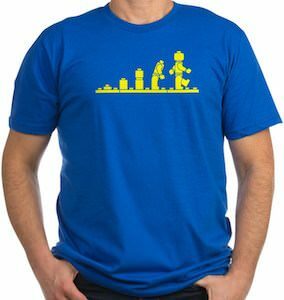 You can get this fun evolution t-shirt in styles for men, women, and kids and yes it does come in many sizes and even in many colors so that you can get the LEGO t-shirt you enjoy best. Come get your LEGO Evolution T-Shirt.